dangerous?! Do they cause any casualties? Every year people get hurt by fireworks, either by simple accidents or because they brought in some cheap and overpowerd "China-Böller" from not even they know where. Are they more dangerous them somwhere else? I doubt it. I know someone whose mate was killed on New Year’s Eve and someone else, whose best friend’s cousin also didn’t survive 31 December. Lets put it like this on new years eve I will never go out anymore in Berlin, when in other countries fireworks should fly up then in Berlin they fly horizontally and this depiction is mild compared what really is going on in Berlin during new years eve. Actually its not eve the bang sounds usually start from noon and end in the morning of 1st of January. 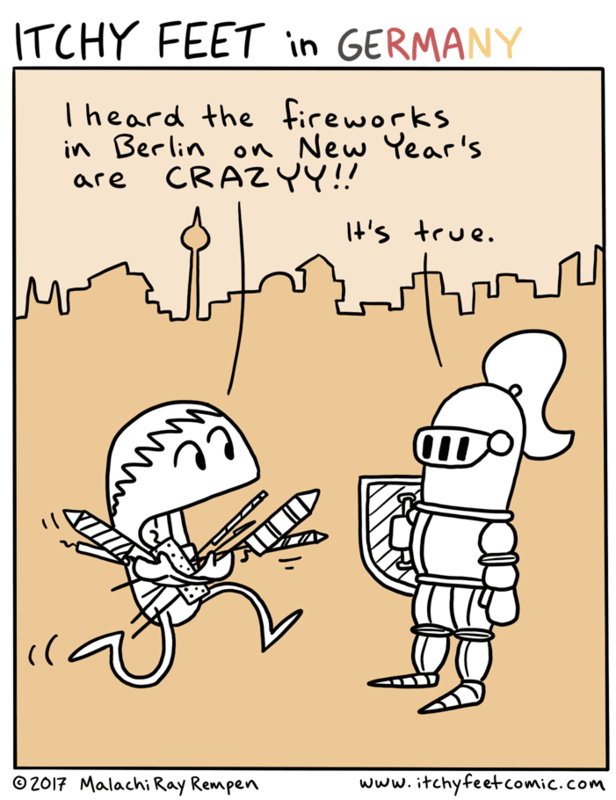 Happy New Year, everyone, and stay safe while handling fireworks! I can't speak for Berlin, but my brother went out onto the open area of Darmstadt's Matildenhöhe on his first New Year's Eve in Germany 25+ years ago, innocently supposing there would be some kind of organised firework display. He was shocked to find fireworks whizzing so close by him that he quickly got away from the area and has never ventured out onto the streets during German New Year celebrations again! So I can confirm that, to Brits of our generation who grew up learning how to avoid accidents with fireworks from the BBC children's TV programme ´Blue Peter`, what happens on the streets at midnight on 31st December in Germany does indeed seem pretty crazy! The situation is pretty bad in various places in India during the Hindu festival of Diwali. It was amazing in Iceland. I was awestruck for hours as the skyline lit up, Icelanders really do it in style.